The original Euston terminal, built by William Cubitt for the London and Birmingham Railway on farmland, was opened in 1837. It was the first inter-city railway station in the capital and at first it had just two platforms – one for arrivals and one for departures. 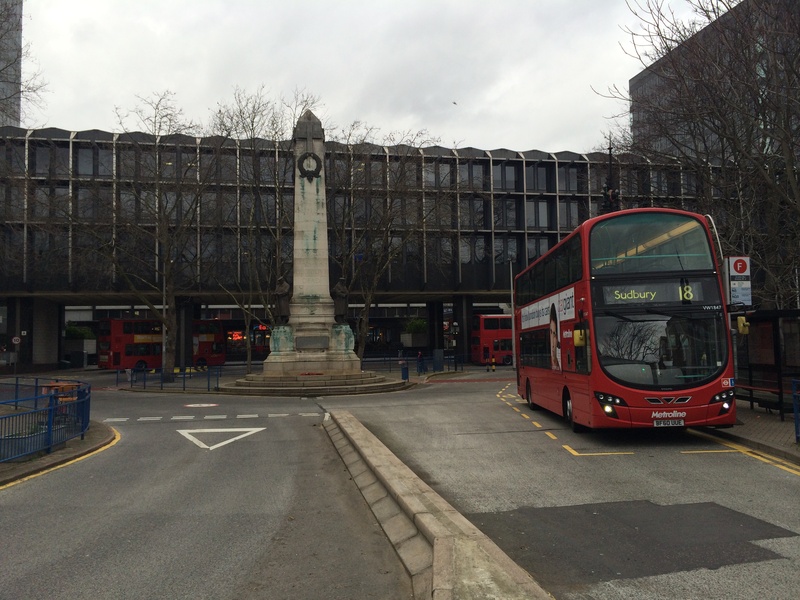 The architect Philip Hardwick also built a distinctive structure, which became known as Euston Arch, marking a spectacular entrance to the station. Interestingly, until 1844 trains were pulled up the incline to Camden Town by cables because using locomotives was prohibited in the Euston area. But by the 1930s the station was extremely congested and there was a clamour by the London, Midland and Scottish Railway to rebuild it. Re-development plans were shelved with the advent of World War Two, only to re-surface again with full force in the 1960s. In what has been described by the Royal Institute of British Architects as “one of the greatest acts of Post-War architectural vandalism in Britain” the Great Hall and the Arch were demolished amid much public outcry. 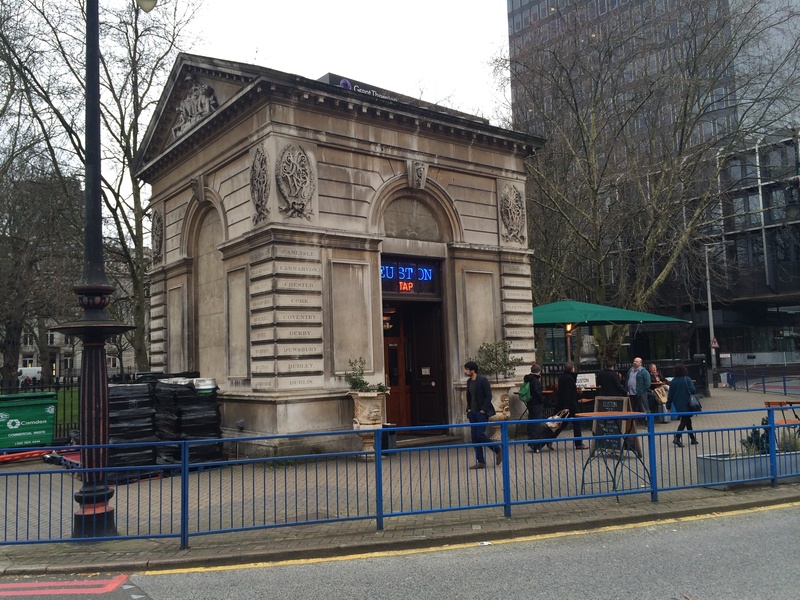 As a result of the works, little of the Victorian station survives bar a number of re-housed statues and the two lodges on Euston Road (now trading as cosy drinking venues at the front of the station forecourt – the Euston Tap (specialising in ales) and the Cider Tap (specialising in ciders). In addition the National Railway Museum houses an 1846 turntable, entrance gates and a few select relics from the Great Hall. But the rest was all wiped out with the new building. “On the first floor above the concourse are further facilities designed to provide the daytime comfort and convenience of a first class hotel. These facilities include a waiting lounge, grill room and snack bar, a licensed bar, a party catering room and high-class toilets with showers and baths. This area is entered from the concourse by a staircase between the entrance to the lounge bar and Sprig Buffet waiting area.” Today the upper level is home to a tatty pub. 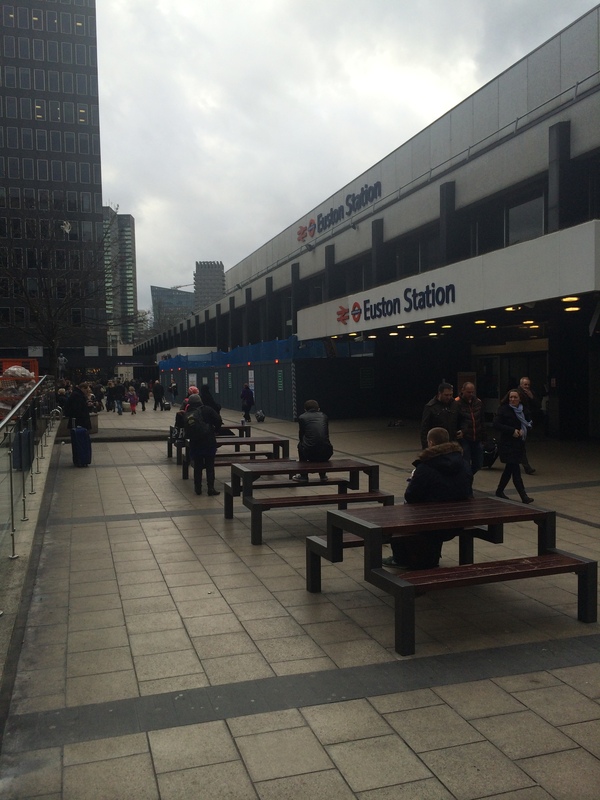 The reality is that 45 years on Euston station is shabby, while the bus stops on the forecourt and underground car park are gloomy. Catering on the main concourse is limited to fast food outlets like Burger King and Harry Ramsdens’. 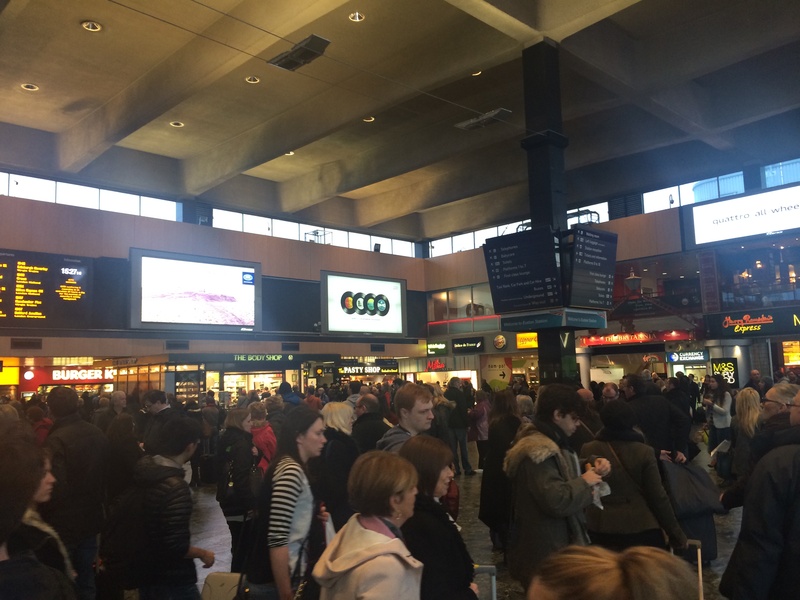 There are no seats, so passengers waiting for their trains are forced to sit on their luggage in front of the main indicator boards before they make a scramble when their platform is announced (“It was planned to accommodate, without crowding or congestion, the maximum number of passengers likely to use the station at peak periods,” according to the 1968 brochure). But the real tragedy is that the developers knocked down the splendid 19th century building, rather than incorporating it into a new design as has been the case at King’s Cross. Building a new station therefore provides the opportunity to create a spectacular new terminal that will serve London for many years to come. This time developers must get the design right. 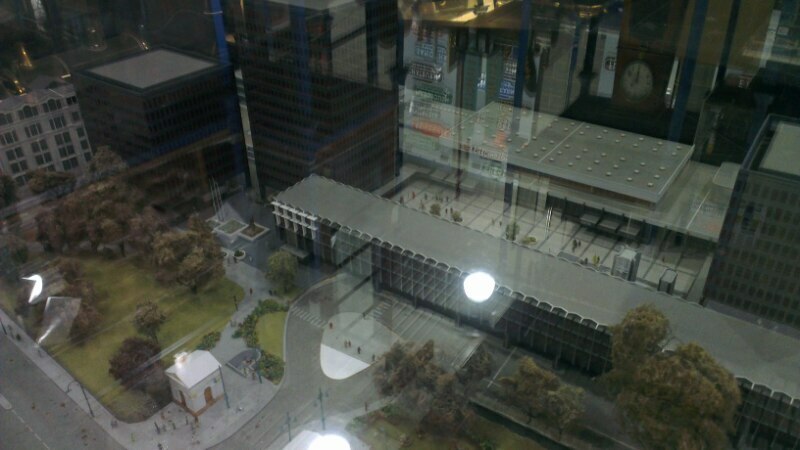 MORE DETAILS: Euston’s proposed masterplan reveals how the station could be rebuilt with an open plaza and a new Euston Arch. The area is much worse now than it used to be when built. One of the few features of merit – a pool and fountain in the front courtyard – is now occupied by a Nandos. There weren’t all of the other shops originally either, which now clutter up the area and block most of the entrance ways to the station. You’ll also notice that all of the small food kiosks and shops both inside and out have been removed already, ready for a 2 story balcony of shops etc to be installed, as per Waterloo. Not sure anyone told George about that. They should make a bigger deal of the redevelopment though, as any offices immediately outside will have a huge benefit of HS2 without the need for a connecting tube journey. All good points Laurie. I’m just gutted that the plan to remove ugly modernist architecture is to replace it with pretty modernist architecture. Call me old fashioned but I’d like it restored to its classical splendor rather than a “look how much glass we can use” competition. Good blog Mark.